Truth: Every wireless musical gadget has to have its publicity photos shot in a park. Never mind that the user/model is wearing headphones, isolated from their idyllic surroundings, and likely struggling to read their iPhone display in the hot sun. The Jammy is no different. It’s a 17-inch-long practice guitar that can not only be taken to the park, but splits in two for carrying on planes. Travel guitars are a thing. A regular guitar — even a tough old electric plank like the Fender Telecaster — is susceptible to damage from being hurled about by abusive, idiotic baggage handlers. 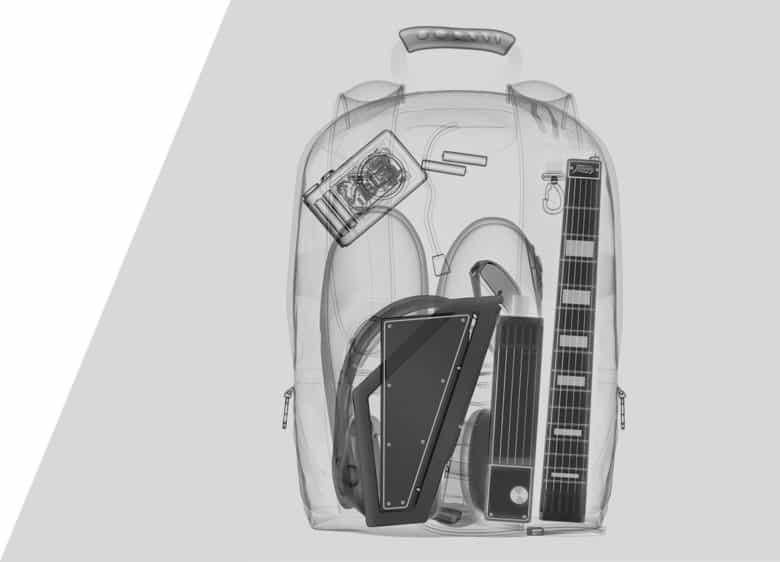 Theoretically, U.S. air passengers are legally allowed to take a musical instrument on board as hand luggage, but there are loopholes that can quickly send things awry. So, you either unbolt the neck from that old Telecaster and pack it with your clothes, or you buy a travel guitar so you can practice on vacations and business trips. 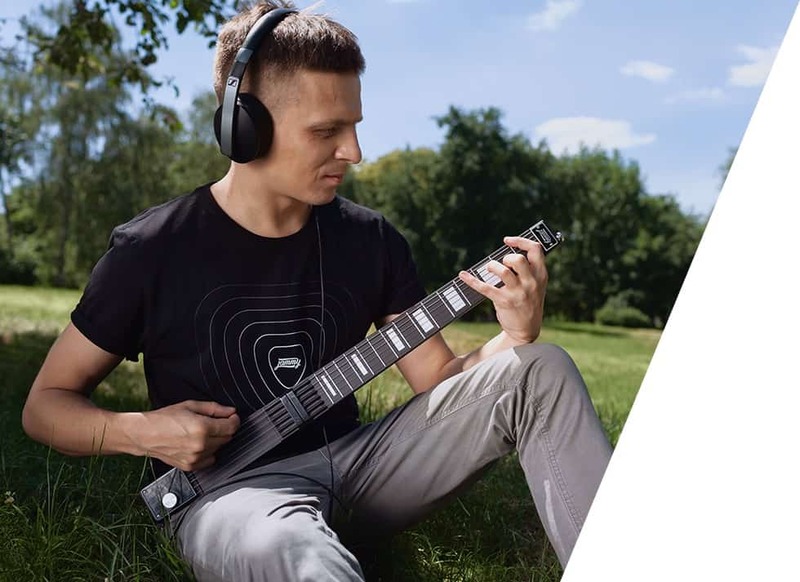 The Jammy is a travel guitar, but it’s also a gadget. The 17-inch-long guitar splits into two parts, uses real guitar strings, and has 15 frets, which is enough for most practice, and more than you’ll ever need for campfire strumming. That’s freedom for you. Who wants to play a guitar in the boring indoors? Not that you’ll be doing much campfire strumming. The only acoustic sound coming from the Jammy will be the plink of its un-amplified strings. To hear anything, you need an amp, or a pair of headphones. That’s good if you’re a sociopath who insists on playing this thing on a crowded plane. The Jammy doesn’t work like a regular guitar. There are actually two sets of strings in here, one in each half of the device. In the neck section, the frets themselves sense where you press the strings. The strumming section detects how hard you play, and you can change the tension of the strings for feel. Because no sound is take from the strings, the guitar can’t be out of tune. And because the sounds are generated on-board, you can pick from three modeled guitar types: nylon and steel-string acoustic, and electric. There is of course an iOS companion app to record, further tweak the sounds, and so on. Or rather, there will be. The Jammy won’t be available to buy until October 2018 at the earliest. You can “pre-order” one now, for $350, but you’re sent to an Indiegogo page to do so. I’d wait. A recent blog post on the Jammy site announced a big redesign, just two months before the thing is supposed to go into production. I’ve settled on a Steinberger as a travel guitar. It’s a regular electric guitar, only trimmed down, and with the tuning “pegs” moved to the body so that the headstock can be cut off. Because it’s a real guitar, it’s just as easy (or hard) to play as any other. And because it is so tiny, I can take it on an plane as cabin baggage. I also never, ever have to deal with any godawful “companion” apps. The only problem is that it looks like a rifle in its case.